Since its founding in 1964, Electrosonic has built a strong reputation for working on complex projects, both large and small, and has developed lasting partnerships with customers and suppliers. Beyond complete integrated systems, Electrosonic provides a comprehensive scope of services including technical design, projector lamp sales, maintenance and operational support. “The students are always transfixed during the Story of Parliament film and feel like they are genuinely in either the House of Commons or the House of Lords during the virtual Chamber experiences.” said Phil Johnson, Centre Manager, Houses of Parliament. 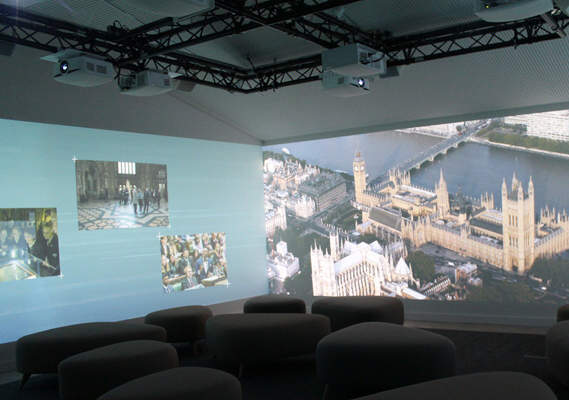 Задача: The Houses of Parliament wanted to bring Parliamentary history to life in its new Parliamentary Education Centre with a 360 degree projection experience. Решение: International audio-visual experts Electrosonic installed eight EH503 ProScene projectors with short throw lenses to project the continuous 360 degree video around the walls. The imagery and sound from six Tannoy Di 5a powered speakers created an immersive experience giving students a feeling of actually being at the centre of political history. Результаты: “The Discovery Space is an outstanding visual experience that is the show piece of our new Education Centre,” said Dr. Emma-Jane Watchorn, Head of Education at the Houses of Parliament. 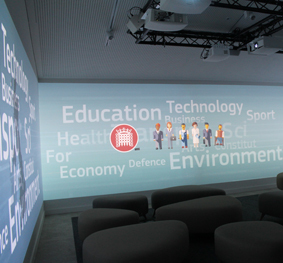 The Houses of Parliament wanted to engage and inspire young people by bringing Parliamentary history to life using audio-visual technology in its new Parliamentary Education Centre. Electrosonic was appointed to oversee all AV design and systems integration for the ‘Discovery Space’. This included 360 degree projection to immerse students in a fast-paced experience, blending engaging content with spectacular visuals. 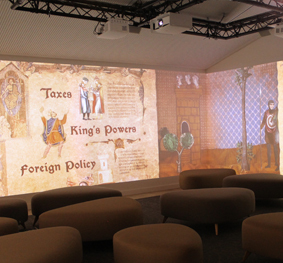 Eight EH503 ProScene projectors with short throw lenses were discreetly ceiling mounted to project the continuous 360 degree video around the walls, giving students a feeling of actually being at the centre of political history. This projector was chosen due to its combination of zoom, lens shift and choice of five lenses including an off-axis short throw. This met the requirements of the 360 degree projection and ensured installation was flexible and straightforward. This bright 5,200-lumen 1080p projector produces vivid colours and pin-sharp imagery. It also has powerful image blending tools with a 3-axis colour matching system and 10x lamp-power steps making it ideal for edge blending projects like this. With full support for Crestron, Extron, AMX, PJ-Link and Telnet LAN commands, the projector can be controlled and monitored remotely over a LAN. Electrosonic worked alongside Centrescreen for the visual content, which included a memorable and visually vibrant 15-minute production where the story of Parliament is brought vividly to life. Students also see recreated events connected to each debating chamber such as when the suffragettes fiercely protested in the House of Commons in 1908, and when the Duchess of Queensbury attempted to gain access to the House of Lords in 1739. The projection is accompanied by six Tannoy Di 5a powered speakers to create an immersive sound. To ensure that all audiences ranging from key stage two to key stage five respond positively to the show’s core messages, two versions of the film were created with differing levels of visual intensity and language used. When entering the room, the desired show can be selected simply via an iPad. The Discovery Space is connected to the Electrosonic ESCAN remote monitoring service to support continuous operational reliability. In the event of a fault occurring with the AV systems, an alert will be created for the Electrosonic team to swiftly respond. All Optoma projectors use DLP technology from Texas Instruments. This uses millions of mirrors to produce high quality imagery which does not suffer colour degradation over time. The dust-sealed, filter free design prevents dust and dirt from affecting the system ensuring optimal image quality with minimal maintenance. The new Education Centre, designed to connect young people with parliament and democracy, was officially opened by Professor Brian Cox in July 2015. 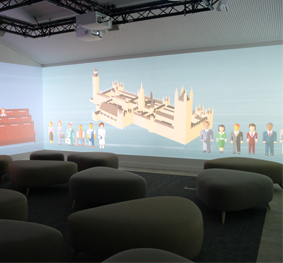 It makes use of creative and immersive technology to create a unique learning experience that generates a sense of anticipation in groups entering the space, and from which groups depart feeling inspired and excited about their Parliament. As a result of the new centre, Parliament’s Education Service is expecting student visits to more than double in 2016 from 45,000 to 100,000.